Experience culture, history, heritage, food, coffee and more while cycling alongside NZ’s longest river from Ngāruawāhia in the North to Lake Karapiro in the South. 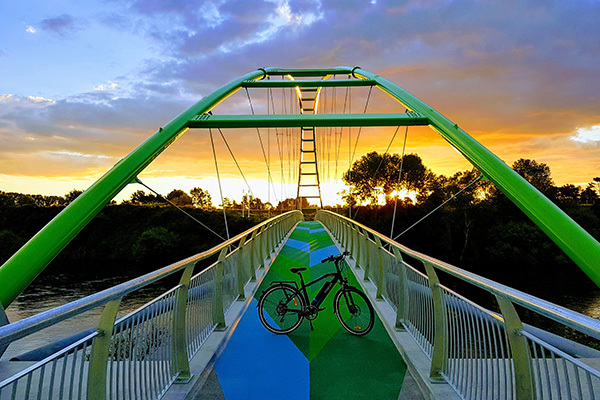 The bridge in Ngāruawāhia, is part of Te Awa ‘The Great New Zealand River Ride’ and will allow pedestrians to access a 61 kilometre cycleway which stretches alongside the river all the way to Lake Karapiro in the south. Its name comes from the Brian Perry Charitable Trust. The Perry Bridge spans the Waikato river next to Ngāruawāhia Golf Course. The 130m long and 3m wide bridge features a flax weaving inspired design which symbolises the weaving together of the various communities that will enjoy the bridge for many years to come, with the colour blue to signify the Waikato River and green to link in with its natural surroundings. The Hakarimata Scenic Reserve in Ngāruawāhia is a great place to see Kauri and to enjoy a walk or tramp through native bush. It is located 17 km north-west of Hamilton, in Ngāruawāhia. It is a great place to enjoy a walk or tramp through native bush, including Kauri, in close proximity to Hamilton. Experience the ‘Mighty Waikato’ on Te Awa The Great New Zealand River Ride from Ngāruawāhia in the North to Lake Karapiro in the South. Explore the 61 kilometers cycle way and discover many hidden gems only accessible on a bike and follow ‘The Waikato Story’ along New Zealand’s largest river on a 1 to 3 day ride on an easy grade 1 & 2 trail. 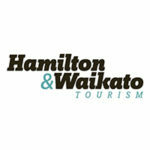 Stop at a Cafe, explore the world class Hamilton Gardens, hop abort the Waikato River Explorer, walk the Hakarimata summit trail, cycle The Perry Bridge, visit the Hamilton Museum all easily accessible by bike.